Portronics has launched the “Mport 4C1” which is a 4-in-1 Type-C to Type C/USB/HDMI/VGA connector. Portronics Mport 4C1 is a smart & sleek, portable plug n play device. It is an on-the-go companion which helps you to connect up to 4 different smart devices of different connector types to the Type C port of your laptop. Ports on it include a USB A 3.0/2.0 ports, 1 USB 3 TYPE C, an HDMI 4Kport with 60FPS and a VGA 1080P Ultra HD. 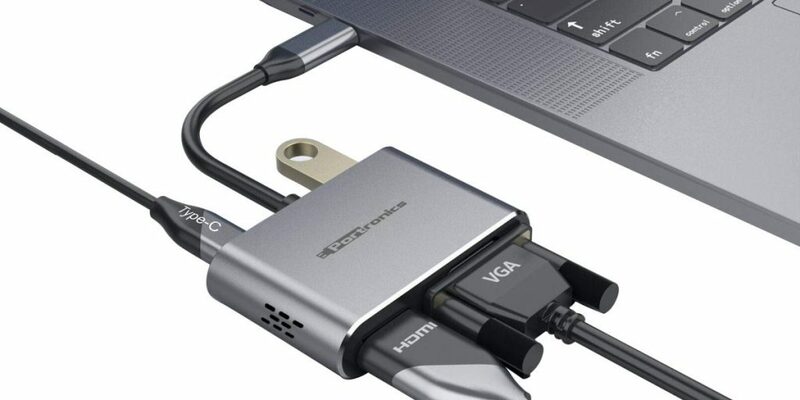 It lets you connect simultaneously with upto 4 different gadgets to your Type C Laptop using 4 ports – a USB 3.0 at a super speed of 5GBPS, a Type C, an HDMI at 4K/60FPS and a VGA 1080P Ultra HD. The Mport 4C1 is a USB 3.0 Type C Multimedia Adapter that not only performs Power Delivery but also facilitates Data transfer. The Mport 4C1 is capable of fast and stable Data transfer. The transfer speed of Type C is 5Gbps, which is 10 times faster as compared to USB 2.0 which is around 480mbps. It also comes with built-in protection from over-voltage and over-current. The Mport 4C1 is designed to keep all your digital devices safe. The Mport 4C1 is a plug n play device that can easily fit into all type of laptops with Type C ports irrespective whether the operating system is Windows, MacOS or Android. It packs an aluminum-alloy finish, and a compact design. Mport 4C1 comes in Silver color, weighs 55 grams. It is priced at Rs. 2,999 and is available from online and offline stores, but you can get it from Amazon.in for as low as Rs. 1999.